I'm really quite late to the no-knead bread scene (first popularised by the NYT in Nov 2006) but thanks to Greedy Goose's post, I was introduced to this exceedingly simple method just in time before I caved in for a breadmachine! I followed a mixture of this online guide and the NYT video instructions above. Yes, no kneading necessary - indeed a six year-old could do this! But is it painless? Unfortunately, there's a different kind of pain - a lot of waiting involved (time does the work for you in creating the gluten structure usually acquired by kneading)! An agonizing test of patience before you can sink your teeth into freshly baked bread! * When finally baked, you still have to let it cool an hour at least before slicing! 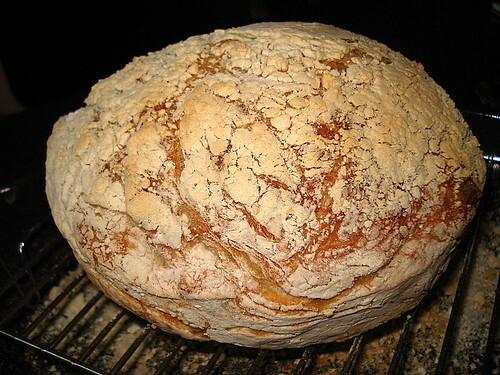 No-knead bread - first ever attempt!, originally uploaded by Camemberu. So this is the end result. Heh, I think I went a little overboard with the flour on the surface, so it's not quite the golden brown crust. And my Pyrex bowl was probably too small, so the bread's become a giant ball. But hey, I'm proud of it! Tastes all right for a rustic loaf - chewy crust and soft insides with a tiny hint of sourdough. 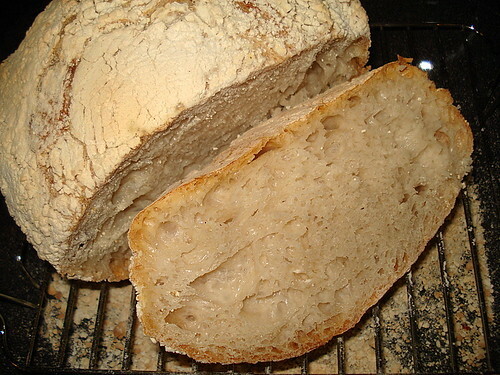 Crusty exterior, soft insides with a hint of sourdough, originally uploaded by Camemberu. Unlike many baking bloggers out there, I am totally a stranger to baking (having grown up without an oven). Even making bread from scratch seems intimidating but now that I've investigated it a little bit more, it's actually seems quite easy and intriguing. I'd even like to try some kneading now - looks fun! Oh what will I put in my next loaf - sundried tomatoes, bacon, cheese, curry? Sesame, sunflower and pumpkin seeds? The two of them continue to banter and improve upon the recipe. Mark tries to cut the time required by adding more yeast, but Jim gives him other modifications. Cos I bake my own bread!! When I am lazy I just dump the ingredients into the bread machine and get my loaf 4 hours later which is better than supermarket bread, espcially when freshly baked. Often, I will make rolls etc. Overall, better taste and less emulsifying chemicals! Ooh cool, Russ. Which bread machine do you use? :P Dang, I'm getting tempted again for new gadget, but kitchen counter space is so limited!